Tucked away comfortably in the Garhwal Himalayas, Kedarnath Temple is one of the holiest and most visited pilgrimage destinations in India. It is also the highest among the 12 Jyotirlingas and obviously a place of immense religious importance. Apart from that, Kedarnath is a part of the Chota Char Dham pilgrimage sites in Uttarakhand. Situated at an altitude of 11,755 ft, the majesty of the surroundings is matched only by that of the temple. For thousands of years, this temple has stood in all its glory, always exuding a mysterious aura. Everything about it is fascinating, from its history to the rituals conducted here. When illuminated at night, the temple looks like a beacon of hope amidst the all-pervading darkness. If you have visited Kedarnath, you must have been overcome by a similar feeling. There is something about it which attracts devotees and visitors repeatedly. Just when you think you know everything about it, you come across another fact which leaves you completely surprised. This blog, which tells you some interesting and amazing facts about Kedarnath Temple, is full of surprises. 1. Eternally protected by the Divine! As if the location of Kedarnath Mandir itself is not a testimony to its invincibility, here’s another fact to reinforce that belief. During the 2013 floods which left nothing but utter devastation in its wake, the temple remained surprisingly intact. According to accounts of eyewitnesses, a massive boulder somehow clung itself to the rear portion of the massive temple. This saved the temple from complete destruction. You may doubt the veracity of those accounts, but certainly, the possibility of a divine intervention in this particular event cannot be ruled out. 2. Bhairo Nath Ji is always on the guard! Kedarnath Temple, which is a divine destination in the Himalayas, is always protected by Bhairon Nath Ji, whose temple lies in close proximity. Bhairo Nath Ji, who is regarded as the guardian of the temple, is also known as the “Kshetrapal”. He is the fiery avatar of Lord Shiva and is associated with devastation and destruction. According to the popular belief, Bhairon Nath ji drives away evil spirits and keeps the temple free from any kind of damage. Also known as Bhairon Baba Mandir, it is located to the south of Kedarnath Temple. In fact, it is interesting to know that those who visit Kedarnath Temple are also required to visit the Bhairon Baba ka Mandir as part of the ritual. Well, you will heart of it, and see it too, while visiting Kedarnath Temple. First time devotees are always surprised at the sight of a lingam which is pyramid-shaped. But then, isn’t everything about this temple extraordinary? The story of how this lingam came to acquire its present shape is also a fascinating one. According to a mythological tale in one of the epics of Hinduism, Mahabharata, Lord Shiva eluded the Pandavas when they sought his forgiveness after the war. Running away from them, he reached Kedarnath, where he disguised himself in the form of a bull. However, even though he planted himself in the ground, his tail was left exposed in the process. Bheem, the strongest of the Pandava brothers, grabbed the bull by the tail, with the intention of pulling him out. In the struggle that followed, the face of the bull was transported to Nepal, leaving only its hump behind. This hump then rose above the ground just like a lingam. Since then, it has been worshipped just like any other lingam across the country, even though it’s the only one of its kind. Kedarnath Temple is part of the Panch Kedar. It refers to the five holy places dedicated to Lord Shiva, all of which are located in the Garhwal Himalayas. Not just that, those deciding to go on a pilgrimage to Panch Kedar have to do so in a strict chronological order. 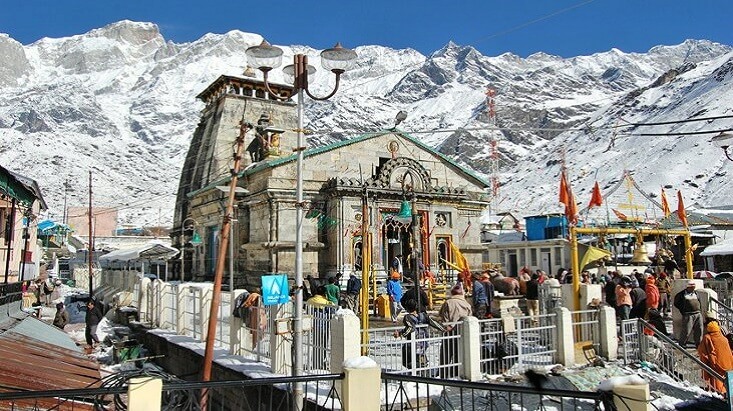 Devotees embarking on a Chota Char Dham of Himalayas pilgrimage are expected to visit Kedarnath first, followed by Tungnath, then Rudranath and Madhyamaheshwar, and finally Kalpeshwar. Not just that, each of these pilgrimage sites have a special significance attached to Lord Shiva. Tungnath, for example, is associated with Lord Shiva’s hands, and Rudranath with his face. Madhyamaheshwar is where Lord Shiva’s stomach and navel are found, while Kalpeshwar is associated with his head. 5. Something special about the priests here! Another interesting fact which you should remember while visiting Kedarnath is that the rituals are performed by members of a special community. The head priest of the temple, who is called a Rawal, belongs to the Veera Shaiva jangam community of Karnataka. Here is the interesting part though. The Rawal, or the head priest, does not perform the rituals inside the temple. He delegates this responsibility to his assistants. During the winter season, the Rawal shifts his base to Ukhimath along with the main deity. The temple consists of five head priests, and each of them are offered the title of head priest by rotation. The pooja itself is performed in the Kannada language. It is a custom which has been followed in the temple for hundreds of years. What also lends the rituals a great historical value is the fact that they are performed in much the same manner as they were in the 10th century. The Kedarnath Temple, standing at an impressive height of almost 3583m, is the highest of all Jyotirlingas in India. The construction of the temple seems even more unbelievable when we take into account its unbelievable height. 7. An example of marvellous engineering! As far as the architecture of the Kedarnath Temple is concerned, it is simply a piece of marvellous engineering. Its impressive dimensions are a testimony to that. It stands at a height of almost 3583m and is believed to have been constructed almost thousand years back. One of the interesting facts about Kedarnath Temple is that it was built from enormous slabs of stone and raised on a rectangular platform about 6ft high. The use of interlocking technique for the stones is especially fascinating. The walls of the temple are supposed to be about 12ft thick in diameter. The inner walls of the assembly are adorned with engravings of various mythological deities. Its brilliant style of construction is also believed to have been a major factor in its remaining quite safe during the devastating 2013 floods. Although the present temple is believed to have been built by Adi Shankaracharya in the 8th century AD, sources trace its origins to the Hindu mythological epic, Mahabharata. According to one of the tales, it’s believed that the Pandavas sought forgiveness from Lord Shiva on the advice of Lord Krishna after the Mahabharata War. However, Lord Shiva continued to elude them. Finally, he reached the spot where the temple today stands, in the form of a bull. Seeing that the Pandavas were relentless in their pursuit, Lord Shiva dived into the ground, with only his hump visible on the surface. It is at this spot today that you see the enormous Nandi Bull seated at a platform almost 6 ft high. This temple’s mythological significance is also a reason why Kedarnath Temple, which is one of the ancient Shiva temples, remains such an attraction among both devotees and tourists. There is an interesting episode mentioned in the Koti Rudra Samhita of the Shiva Purana. It states that Nar and Narayan, twin brothers and avatars of Lord Vishnu, worshipped Lord Shiva by constructing a temporary shivling in the village of Badrika. They undertook severe penance, part of which was standing on one leg for thousands of years. Impressed with their unending devotion and hard penance, Lord Shiva finally appeared and asked them to make a wish. Nar and Narayan asked Lord Shiva to make this place his permanent abode in his original form. Granting that wish, he stayed there as jyoti (radiance) in a place called Kedar. That is how this place came to be known as Kedarnath. Shiv Puran also states that the devotees who die in Kedarnath or give up their lives in the attempt to reach it are immediately absolved from their sins. It is also believed that pilgrims who drink water from Kedarnath after seeking Lord Shiva’s blessings will attain ultimate salvation. What is the best time to visit Kedarnath? At the very outset, it should be remembered that Kedarnath Temple is closed for six months of the year. This is done due to near inhospitable weather conditions, a part of which is extreme snowfall. It also renders the town inaccessible to the nearby cities. According to the Hindu calendar, the temple remains closed from Bhai Duj (which is the second day after Diwali) to Akshaya Tritiya (which is celebrated in the month of April or May). Having said that, you can visit the temple from the months of April or May to the months from October to November, depending on the weather conditions. You should keep in mind at all times that even during the month of May, temperatures can plummet to 3°C, in case of rainfall. Many tourists prefer visiting Kedarnath during the month of September. The scenic views during this time is spellbinding and makes for some incredible photography! Do I need registration for visiting Kedarnath? Registration is compulsory for all devotees wanting to visit Kedarnath Mandir, which is counted as one of the Chota Char Dham of Himalayas. This rule came into effect in 2014. After registration, all devotees are issued a Biometric Card. There are two ways of registering for the Char Dham Yatra: offline and online. You can register offline at any one of the 14 registration centers approved by the Government of Uttarakhand. You can also choose to register online for the yatra. To do so, you will have to fill up an online form and follow the required steps. In addition, you will have to pay a nominal fee of Rs. 50. What are the Puja Timings in Kedarnath Temple? You should plan your visit to the temple as per the pooja timings so as to be able to witness the ritual and seek blessings from the main deity. The pooja timings in the Kedarnath Temple are decided by the head priest, or the Rawal, as he is called. The temple is closed for visitors from 3-5 pm. You should visit the the temple for the morning darshan from 4 AM to 3 PM. The timings for evening darshan are 5 PM to 9 PM. After visiting the Kedarnath Temple, there are other places of religious, cultural and mythological significance which you can visit. It is a glacial lake situated at a height of almost 14,200ft. The serenity and beauty of the surroundings immediately win your heart. This lake also has a mythological significance attached to it. According to Hindu mythology, Lord Vishnu bathed in its pure waters on the occasion of Raksha Bandhan (or Rakhi, as we call it today). Once you are at the lake, check out the Brahma Kamal and others flowers which lend the lake a delightful appearance. Chances are that you will visit this place of immense religious importance during your visit to Kedarnath Temple. It is here that Adi Shankaracharya, the great philosopher and theologian of Hinduism, breathed his last. The 2013 flash floods destroyed most of this place, but you can still go and pay your respects to what remains. Located near Kedarnath between Guptkashi and Gaurikund, Sonprayag should be visited simply because of its incredible vistas. The mind and body feel rejuvenated at such freshness and beauty. Lying at the confluence of two holy rivers, Basuki and Mandakini, it also holds religious significance. According to various scriptures in Hinduism, bathing at such prayags (confluences) leads to the attainment of moksha, or, ultimate liberation. The town of Kedarnath is well connected to the rest of the cities and towns of Uttarakhand by air, train and road. The nearest airport to Kedarnath is the Jolly Grant Airport, located at a distance of almost 238 km. This airport operates daily flights to Delhi. From Jolly Grant Airport, you can hire taxis and private vehicles to reach Gaurikund, which is the base for the trek to Kedarnath Temple. You can also avail the helicopter services which are available for Kedarnath Temple. Helicopter services to Kedarnath is provided by Pawan Hans (a national helicopter carrier in India) and are also available from Dehradun and Agastyamuni. Rishikesh and Haridwar Railway Stations are the nearest railway station to Kedarnath. There are trains available to all the major cities of India. From both Haridwar and Rishikesh Railway Station, you can hire taxis and private vehicles to take you to Gaurikund. To reach Kedarnath Temple, you will first have to reach Gaurikund, which is the base from where the trek to the temple begins. Gaurikund is well connected by roads to all the major cities and towns of Uttarakhand. It lies on NH 109 which connects Rudraprayag to Kedarnath. Buses, taxis and private vehicles are available to Gaurikund from several cities including Haridwar, Tehri, Pauri, Rishikesh, Dehradun, Chamoli and Uttarkashi.